Create your own personal retreat at home and transform your backyard into an oasis with a new above ground swimming pool! We have a wide selection of above ground swimming pool styles that won’t break the bank, are sure to fit into almost any backyard, and will add beauty to your landscape and bring home fun for the entire family. We feature unique, beautiful and ultra-modern styles that will seduce you immediately. 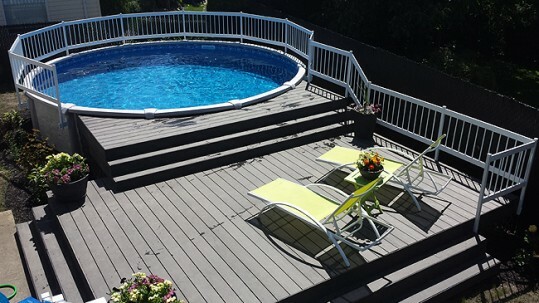 Our unique aboveground pools are sure to satisfy anyone in the market for something a little “different”. 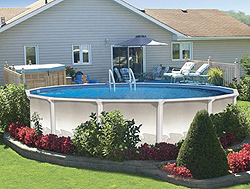 Above Ground swimming pools are the most versatile non-permanent structures. They are very affordable. Our pools are available in a kit or you can have our experienced crews do the complete installation. Talk to one our backyard designers and we can show you how to build your very own backyard oasis. Above ground pools are built entirely on the top of the ground in your yard. They can be left free standing or have the option of building a deck around it. They come in various sizes. from as small as round 12 foot to a 18 x 33 oval shape! They come in a kit to build yourself or we will be happy to build it for you. The decision to add a pool in your backyard is one that you will never regret. That is why Premium Pool and Spas wants to see everyone in the Okanagan, who may be considering a pool, to get the best price on swimming pools that they can. Let us help you do that! We’ve been selling and building pools for years now and have the experience of helping you attain your backyard oasis without spending an arm and a leg! Come on down to our store in Kelowna or Vernon to get a quote on a custom pool built and priced just for you and your budget. With so many pools to choose from, making a selection can be a challenge. Contact our pool professionals who will help guide you through the process and show you how easy it can be to transform your backyard into an oasis.